Lambretta, the brand name of a line of motor scooters, which is owned by a Switzerland based manufacturer Innocenti S.A now, Lambretta has returned with 3 new scooters. The scooter under the brand name used to assembled in India under license between 1950 to early 1990 by Automobile products of India(API) and Scooters India Limited (SIL). From the last two decades, the company was staying away from the global market due to financial issues of Innocenti. British Leyland Motor Corporation had acquired the Innocenti in 1972 and after that, it closed and tried to get back as Innocenti S.A.
After a long wait, V50 special, V125 special, and V200 special scooters are in the market to hold a badge of Lambretta. The scooters are unveiled at EICMA show 2017 in Milan, Italy with diverse engine capabilities and two variants which are Fixed fender and Flex fender on each scooter. The new Lambretta scooters will be manufactured in Taiwan and will be available in the European market by early 2018, in other markets in June 2018. All three new models are metal-bodied, using same platform & dimensions but varies in engine specs and have the same 6.5-litre fuel tank. The V50 Special gets a 49.5cc, air-cooled, single-cylinder, a carburetted engine which is able to churn out a maximum power of 3.5 HP at 7,500 RPM and 3.4 Nm of torque at 6,500 RPM. The V125 Special is powered by a 124.7 cc fuel-injected motor which is able to churn out a maximum power of 10.1 Hp at 8,500 RPM and maximum torque of 9.2Nm at 7,000 RPM. The V200 special is equipped with a fuel-injected 168.9 cc engine which produces a maximum power of 12.1 HP at 7,500 RPM and maximum torque of 12.5 Nm at 5,500 RPM. A motor of all three models is belt-driven by a CVT(continuously variable transmission). All the three V special scooters have LED headlights, LED turn-signal indicator, LED tail light, and a 12-volt charging socket. A 220 mm hydraulic disc brakes and a telescopic fork at the front and 110mm rear drum brakes are identical in all three models. Only V200 special gets a Bosch ABS control and V125 takes a combined braking system. The scooters have a seat of 770mm height which is same as Vespa 125 and 150 in India. 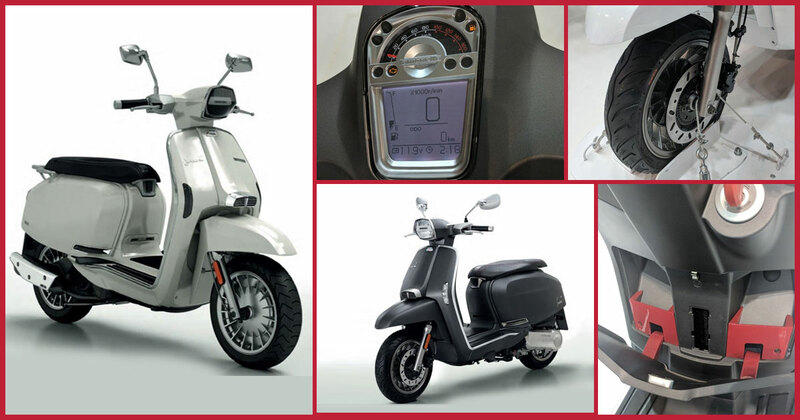 The wheelbase of motorcycles stays at 1,330 mm and is 40 mm longer than the Vespa India-spec model. India can expect the Lambretta scooters to be presented in 2019 as Innocenti S.A. which is looking for centre spread in India. Representatives of the company at EICMA 2017 has mentioned that manufacturing and assembling of the scooters are expected in India due to cost and volume factors. Till now, it is not confirmed by the company that it will go independently or tie up with some local partners.